Well, after what seemed to be an almost interminable length of time spent sanding and filling and french polishing, I finally declared build #8 done yesterday. 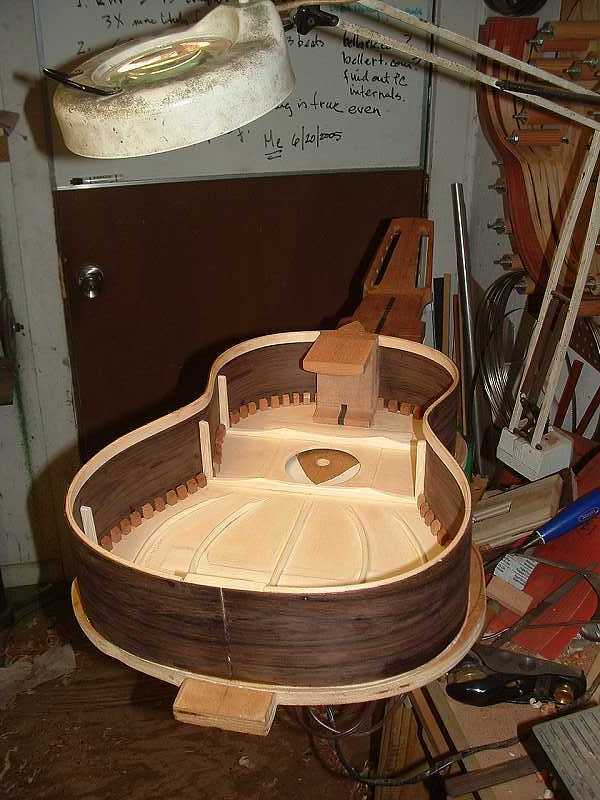 This is the way it looks before attaching the bridge and installing the tuners. 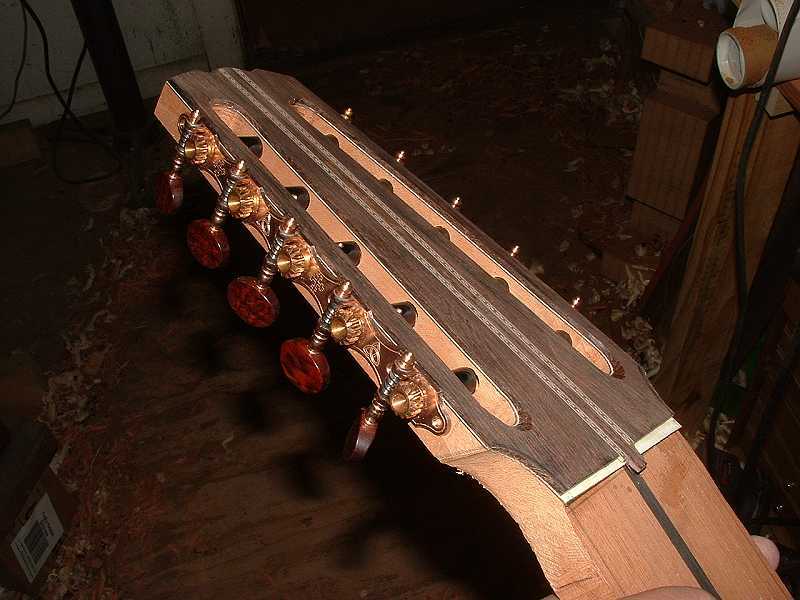 Here it is after the bridge and the tuners are installed. Haven't cut the nut and saddle yet. I'll wait until the strings come in. Just waiting on a set of strings now. 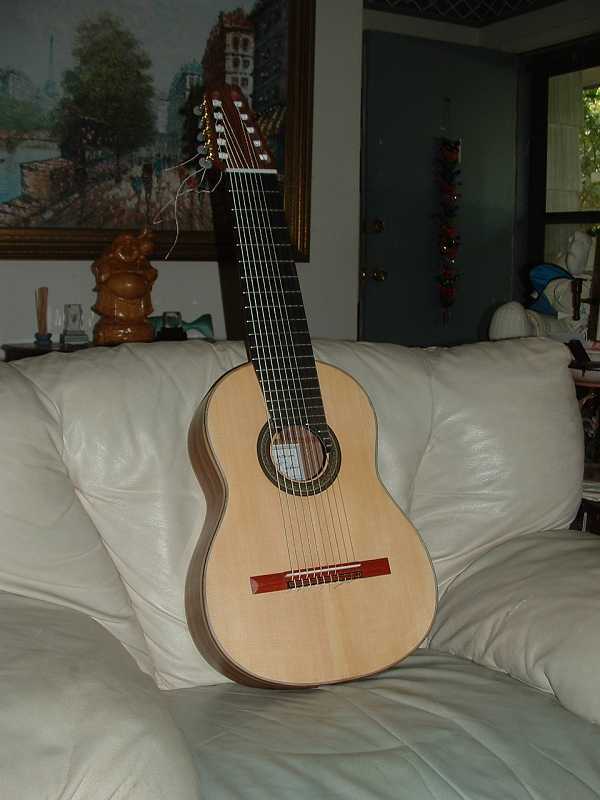 Can't go down to the local guitar shop and say, "Hey, give me a set of baroque tuning strings for a 10-string guitar." You'll just get funny looks. So, the set should be here tomorrow or the day after. Can't wait. In the mean time, I've been working more on guitar 9. Yesterday, I thicknessed and glued down the headplate and veneers. This morning, I began the process of laying out the headstock dimensions and then cutting out the headstock. I lay the dimensions out directly on the headplate with a pencil and rulers. 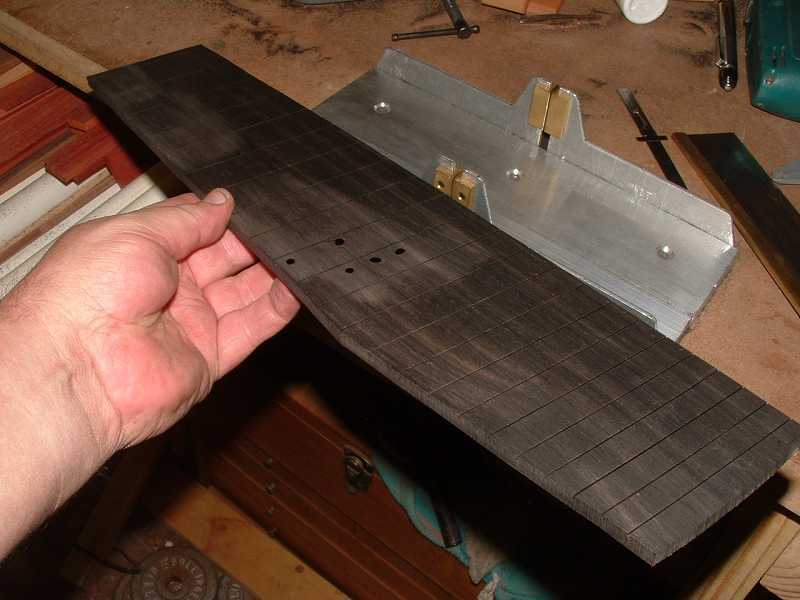 I then cut the 10-string headstock out to its basic outline, and then plane the edges smooth, making sure that the edges are exactly perpendicular to the headplate. I use my milling machine to bore the tuner holes. It doesn't take much longer than using a jig, and it's just as accurate, if not more so. 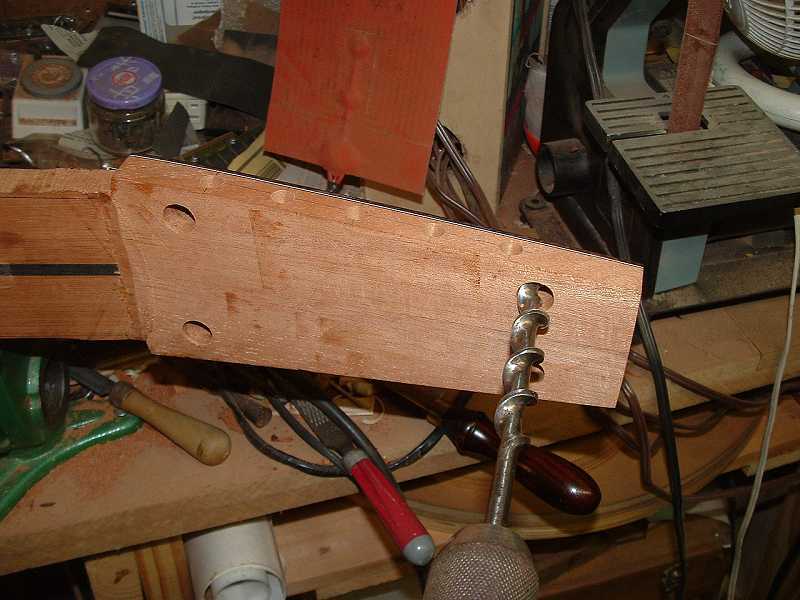 After drilling the tuner holes, I drill the 5/8" holes that will be the endpoints of the tuner slots. I use a bit brace for this. So far, the bit has cut cleanly through every sort of headplate material I've used. This headplate is Brazilian rosewood. It is a little dry and brittle and chipped out only along one small edge, which fortunately is where the bevel will be filed for string clearances. Backing up for a bit -- I drill four pilot holes at the 5/8" hole centerlines before drilling the holes all the way through with the bit brace. I do this because I drill the 5/8" holes out from both sides, to reduce the chance of getting any chip-out or splintering. Drilling a pilot hole first increases the odds that the 5/8" holes, when drilled from each face, will meet in the middle. I start on the headplate face, then flip the neck over, and . 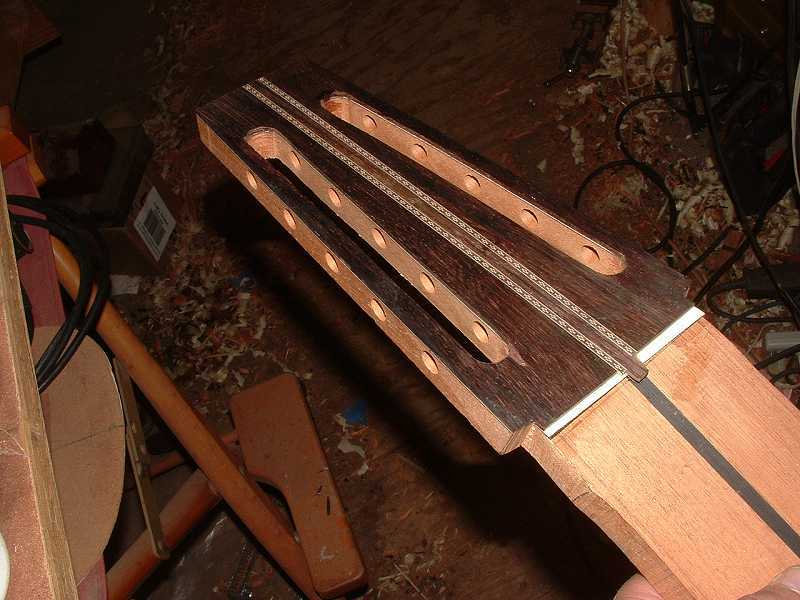 . .
After finishing the slots, I contoured the headstock. Then installed the tuners for the money shot. You are taking to those old hand tools very well indeed. Haven't known anyone else who used a brace and bit for a long time. BTW Those bits are fairly easy to keep sharpened. The side spurs [the ones that define the edges of the hole] are easy to sharpen. Keeping them sharp really reduces splinters too. Do you have a full set of bits? I keep mine in a wooden box - just in case. No fooling, if you hone the cutting edges and keep a little wax on the metal those bits will work wonders. I have a screw driver bit for my brace that has proven to be very handy for driving or removing big screws. I see you drilled the holes before you cut out the slot. There was a lesson learned somewhere there. Hope you are very proud of the #8 10 string. You have done a great job. Yeah, I really like using the "old-school" stuff whenever I can. I like using a bit brace because I have a lot more control over the cut, although I guess a Forstner bit chucked up in a drill press would probably actually work a bit better. Not as much fun, though. Yes, I have a relatively complete set of bit braces (inherited from my grandfather), and yes I almost immediately figured out how to sharpen the cutting edge of the bit so as to avoid tear out. In my case, I have a small 1" belt sander that I used to file down the bit edges. This works pretty well, and probably prevents tearout. How does it sound? Welp, the short answer is, it sounds like a 10-string. A 10-string has a different sound than 6-strings, even when you're playing the lower six strings only and muting the upper four. More piano like, in a way. So far so good, though. It has plenty of volume, the highs are bright and the basses are quite powerful. Perhaps even a little louder than the basses on my old Ramirez. I'm pretty pround of this one. It's my best yet. One down, and one to go. Your skill level has taken a quantum leap from when you built your first one just over a year ago. Congratulations! A lot of people give up after their first or second effort. I applaud your intestinal fortitude. Thanks for sharing your journey. Nice job. I agree with David - you have come a long way! That used to piss me off at work. "Nice job on you last project - so - what are you going to do for us next?" This is guitar building though so I always kind-of look forward to the next one. Guess we should have begun building guitars full time a long ago. Sure beats driving thru traffic to go to work too. You should be proud of this one. Maybe you can keep it awhile and play it ? Nice work Michael. I'm impressed! I wish we could figure out a way to pass these around and play them, just for 30 minutes or so. Thanks to all of you for your kind words. 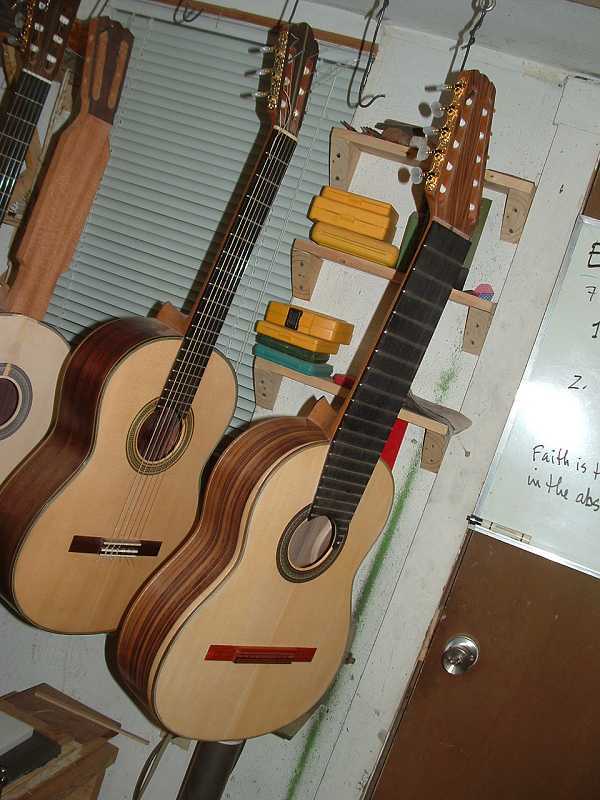 I really need to state that, if it weren't for this forum and the exceptional caliber of talented luthiers here who freely share their knowledge, getting to this point as relatively quickly as I have, would simply not have been possible. Considering that I'm now receiving kudos from those of you for whom I have great respect makes it all the more fulfilling. This is the first guitar I've completed that I feel is of a level of cosmetic quality where I can show it off with some pride. And I will. But right now I'm really leaning toward keeping this one so that I will have an outstanding example of what I can do for future clientelle to evaluate. 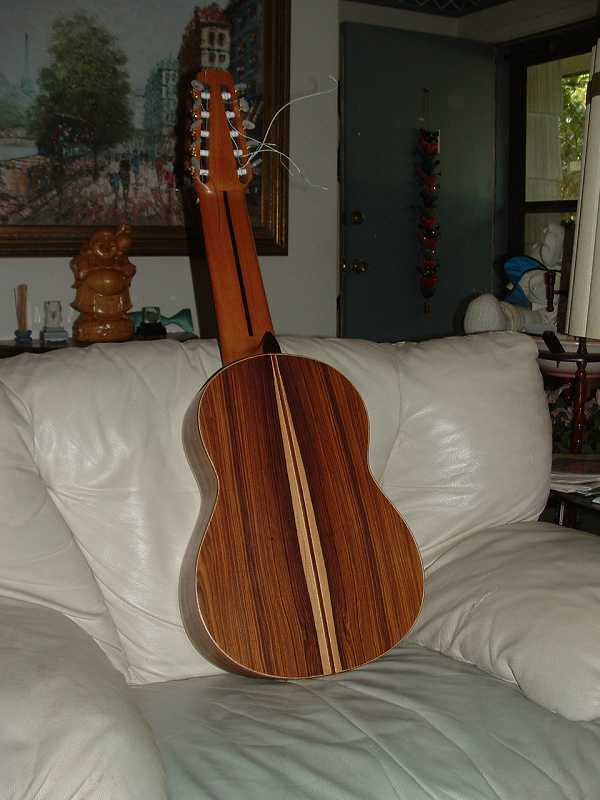 I have to say that's a fine looking 10 string classical . You have my vote on this one, nice work michael. now that will make you money. Well, I'm really glad that you are so pleased with the sound. You have been so damn honest in showing any wart that might appear on any of your builds, that I'm convinced that you know this one sounds great. It's obvious that the craftsmanship is awesome, and it is great to hear that you are more than satisfied with the sound. I have been in way too many similar jams in my life -- many much worse -- where I've learned from experience that there is always a way to a solution. The key is to slow down, evaluate, and be patient. The solution will come. Fortunately, I didn't hit any major snags with this build so things really went pretty smoothly. I can't take credit for this tip. 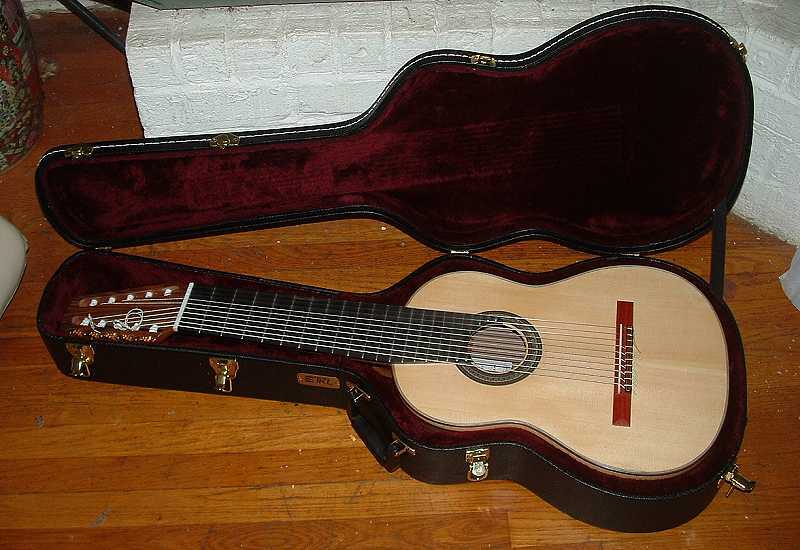 Stephen Bright found out that a 10-string classical will fit in a Martin 00 style case. So, I hied myself on down to my local guitar shop today, 10-string in hand, and tried out a few. Sure enough, we found a TKL case for a 00 that fit my 10-string perfectly. I know the owner of the shop. He's a classical player and I always bring my new builds in for him to try out. He got to play the 10-string today, and liked it a LOT. He also gave me a good deal on the TKL -- $75 out the door. 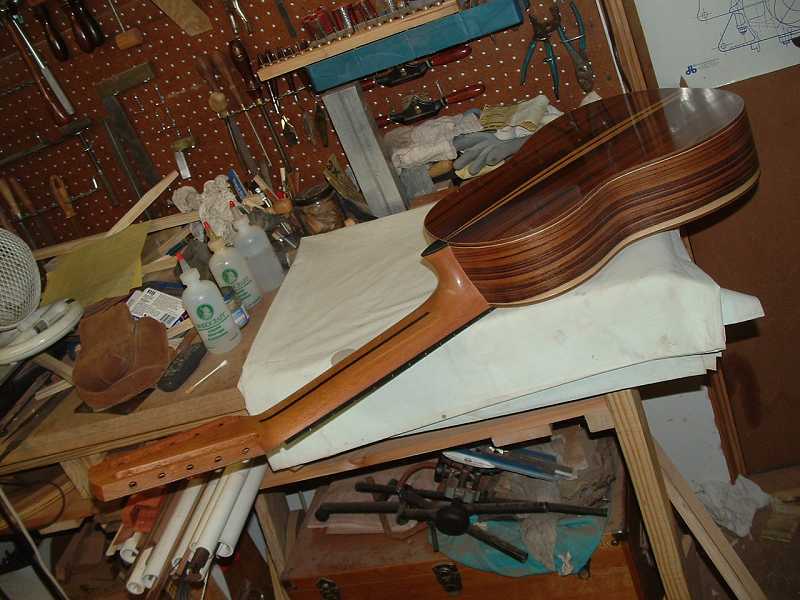 All I had to do was modify the cradle that supports the neck. The cradle, as it turns out, is made from styrofoam. I just pulled back on it to try and get it to separate from the accessory pocket. It ended up breaking about an inch up from the base. Then I pulled the plush covering away from it. I sketched out the contour for the neck that I wanted on this cradle fragment, cut it out on the bandsaw, then reinstalled it with some tightbond, gluing it back where it had broken off. I just pushed the plush covering back over the styro, tucked it back around the edges and snugged it down. Didn't even need to reglue it, really. It ain't going nowhere. Even though I've completed number 8 and it's been strung up for almost a week now, work on number 9 continues. 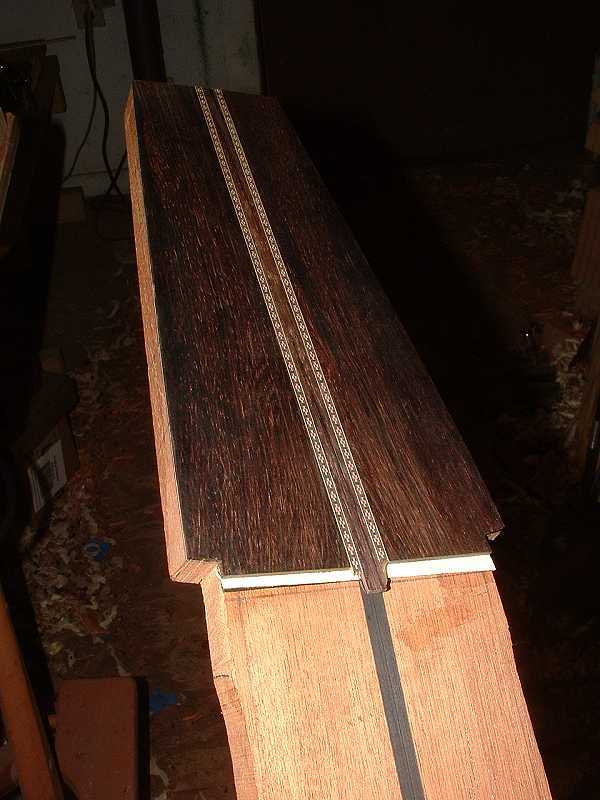 I completed the neck heel to the point where it is ready for sanding, and completed the inside of the neck block/foot/tongue to its final finished state, since this portion will be inside the guitar. 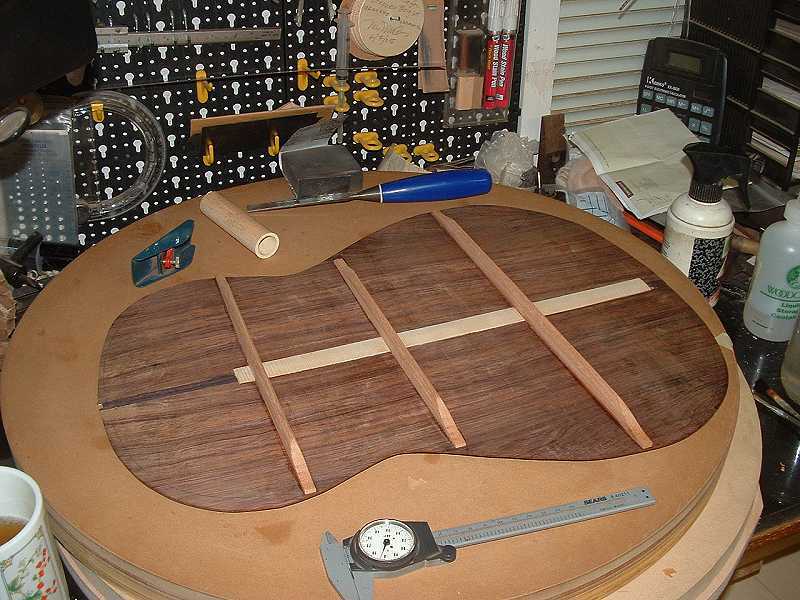 Then I glued the neck and tailblock onto the soundboard. Here the assembly is resting on a hook while I tune up the sides again. They relaxed a bit since I bent them a couple weeks ago. Next I set the sides in place and glued in the wedges to secure them. 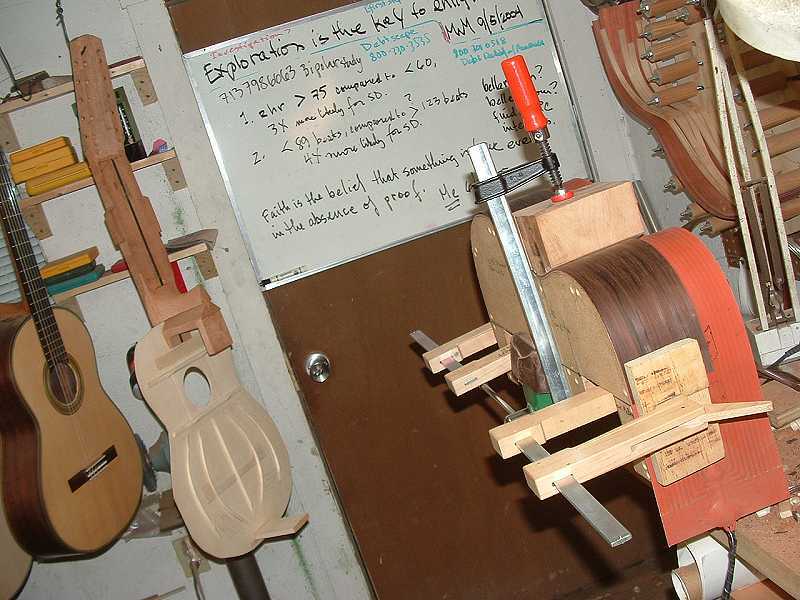 Even though Rik Middleton's method is easier than cutting slots, it is not faster. 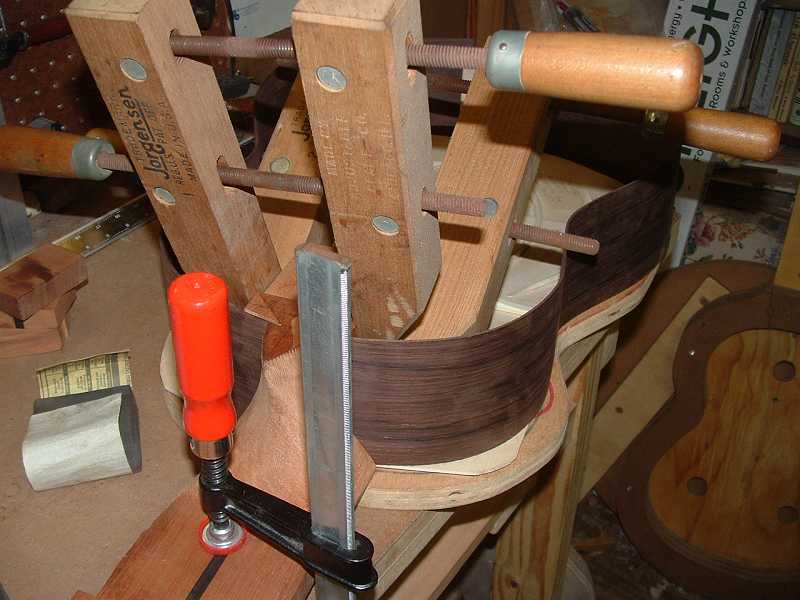 Reason is, I find I have to glue down the wedges first before gluing the sides to the soundboard. So, I have to wait for the glue to dry before I can proceed to the next step. 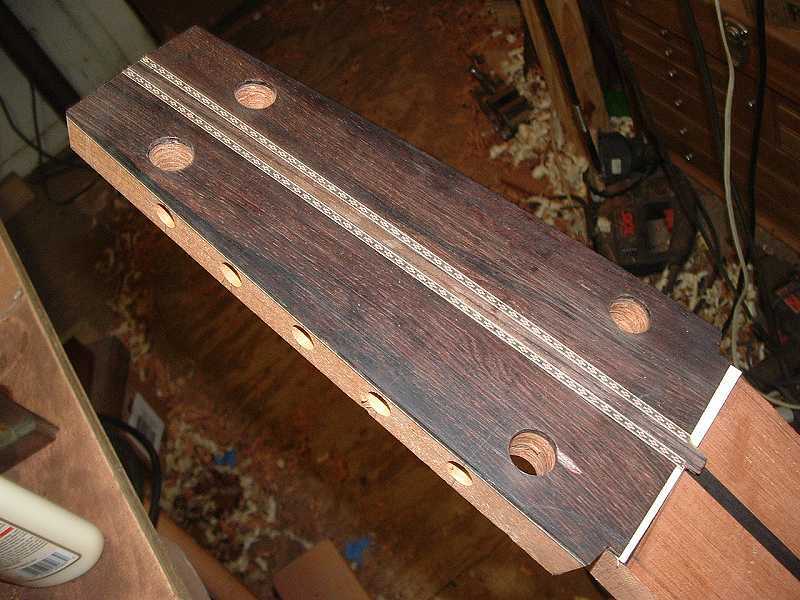 If one just cuts slots, one sets the sides in place, wedging them tight with shims if necessary, and immediately glues them down to the soundboard. I can see the day that, once I've nailed a consistent way to accurately cut side slots (like when I can afford a decent table saw), I'll switch back to the old method. The back is braced up and ready to go. While waiting for the glue to dry in the various steps, I tackled the fingerboard. This one is wider than the one I used for number 8, so I have a bit more freedom with regards to its final shape and fit. The spots you see are a few drops of CA I used to fill some small imperfections. Finally, I've got the sides, the side braces, and the linings in place. 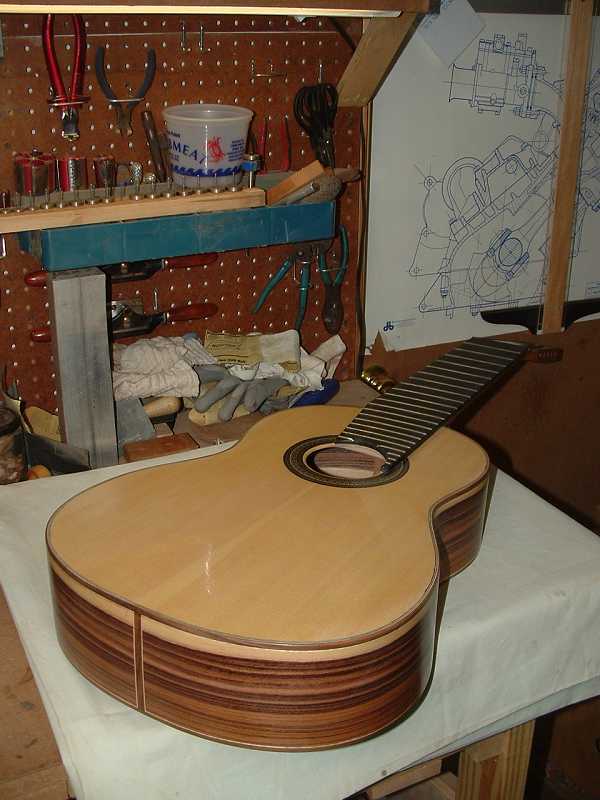 Tomorrow, I'll cut recesses into the linings for the back braces, and install the back. Then the fun starts. Wait till you see the purfling I'm having to install. Michael, (I'm being lazy) Did you mention somewhere why you use solid lining at the rims/back, and kerfed at the rims/top? 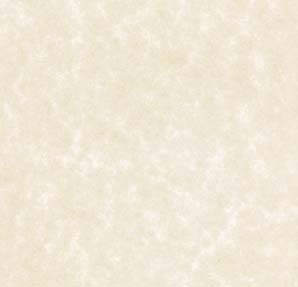 Also, what material and dimensions are you using for the solid lining?